October 9, 2012 | Category Newsletter, Resources. The TMJ connects the mandible to the temporal bones of the skull and is a common place to hold tension. TMJ pain can often result from injury due to whiplash. It may arise after dental work or oral surgery. It can also occur from poor posture, especially a head forward type posture. 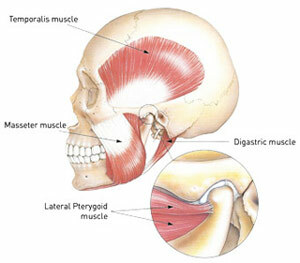 Massage therapy can be very helpful in relieving TMJ pain and or dysfunction. Your RMT will assess your overall posture and neck and jaw mobility. They will release any muscles causing imbalances to allow your neck and head to rest more comfortably on your spine. This will likely include work on the neck, head, and face musculature, as well as the cervical joints. Intra-oral work may be used. This requires the therapist to wear gloves and work inside the mouth to release affected muscles. Cranio-sacral work may also be used to mobilize the bones of the skull.